The Rotary Club of Middlebury is pleased to announce the results of our 2016/2017 Fundraising and Grant Awards year. Our President for the year, Ben Fuller, oversaw a robust and productive fundraising effort that included our popular holiday Flag Project, the Buster Brush Golf Tournament, the Maple Run Breakfast as well as our 9th annual Spring Online Auction. At the annual Gala Dinner on May 19, at the culmination of Rotary Week, the club was proud to distribute over $60,000 in Grants to local organizations including HOPE, Elderly Services, MREMS, Addison County Home Health and Hospice, Open Door Clinic and the Middlebury New Filmmakers Festival. These and more than 20 other organizations were beneficiaries of the hard work and unselfish dedication of the 54 members of the Club. As we begin our new Rotary Year under the direction of President Tom Telling, we are looking forward to another great year supporting the good works of our local non-profits as well as our many member supported service projects. We are also excited to announce our first annual Fall Festival to be held on Sunday, September 24th on the lawn behind the Mahaney Arts Center. The Rotary Club of Middlebury thanks all of their supporters last year who helped our Club achieve its goals. 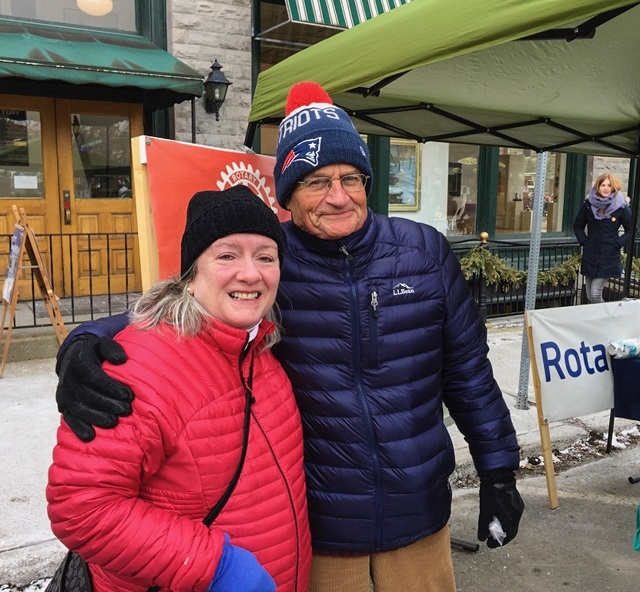 Rotarians Maureen and Karl help at the 2017 Chilie Festival on Main Street.